Cuckoo clocks are excellent timepieces. However, they require careful maintenance to remain in good working order. A common problem you will find when buying these clocks second hand is that they do not chime the correct number of tones on the hour. This is most likely due to the fact that, as previous owners changed the time, they did not pause for the cuckoo when moving the hands round the clock face. It is simple to rectify this problem. Pull up the weights. Do this by pulling down one end of the winding chain until the other end is resting below the clock. Set the clock to six o'clock by turning the hour hand. 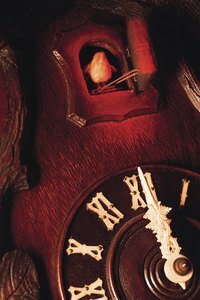 Depending on the clock you may need to loosen the nut holding the hour hand on the front of the clock face. This can be done by hand. Open the door on the clock's right side to gain access to the mechanism. Push the vertical wire that controls the cuckoo to produce the cuckoo sound. Press the wire till it makes the full hour sound. Reset the clock the to the current time. Pause to let the cuckoo call whenever you pass the hour or half hour. Close the door and pull the chain down so there's an equal length on both sides.